'Tis said of that ancient brooding forest that before the world grew accustomed to the light of day, her stems had grown high and her eaves dark and contemplative. If ever those ancient trees pondered, then they wondered on the creatures which have come from the Outlands to slip beneath their shadowy canopies. The Darkenfold swallows you in a sea of green. The tangles and briars of the forest's edge have given way to the rough roads of the hinterland. Giant trees with huge boles tower above you, cloaking you in a leafy mantle. You know from tales that these woods are the haunts of the famous Quagmire, a merciless rogue troll lord who, over his long career, has left a trail of death and destruction behind him. The Mortality of Green is a fast-paced adventure of pursuit through a deadly forest. Quagmire the Troll Lord has stolen a sacred tree from the Druidic Council. The evil troll seeks to plant the tree amid the roots of his evil master, a decayed Sentient Tree from the Days before Days. If the characters cannot stop him, the Darkenfold shall be corrupted for all time. This challenging d20 system adventure for 4-6 characters of levels 3-5 needs heroes of quick thought and even quicker action. 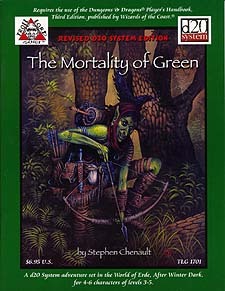 Detailing the Darkenfold Forest in the World of Erde, The Mortality of Green provides DMs with enough information to run a mini-campaign of epic, sword and sorcery advneture.